Today’s livestream with Beamdog CEO Trent Oster and Studio Director Phillip Daigle brought more news about Neverwinter Nights: Enhanced Edition Head Start, the 2.5 patch for Baldur’s Gate: Enhanced Edition, Baldur’s Gate II: Enhanced Edition and Icewind Dale: Enhanced Edition, the mobile sale of all Enhanced Edition titles and our current open job listings. 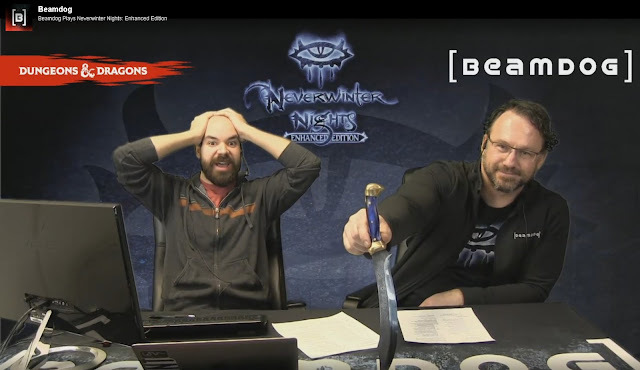 During this, Phil played Shadows of Undrentide while Trent shared secrets of making an iron-shod dagger. Missed the stream? It's on YouTube (part 1 and part 2) and Twitch! Enhanced Editions on Google Play and the App Store are on sale for just 50% until the end of January. Beat those January blahs and escape to the exciting world of Dungeons & Dragons! The team is working on the 2.5 patch for Baldur’s Gate: Enhanced Edition, Baldur’s Gate II: Enhanced Edition and Icewind Dale: Enhanced Edition. The beta turned up a number of fixes required before the release of the update. We'll have more to share about it soon. Based on feedback from the community we’ve decided to move the update cadence for Neverwinter Nights: Enhanced Edition Head Start from 1 week to 2 weeks. When we update the game too often, NWN:EE persistent worlds servers have to constantly migrate to new builds, so we’re trying to find a balance. There’s no new patch for NWN:EE today but the work continues. This week has seen quite a few exciting updates on the Roadmap Trello board. Cards for armor.2da full customization, more custom animation "slots", more data in character .bic for persistence support, separating "hearing" from render, allowing invisible objects to speak (with chat) and making other sounds (footsteps), as well as exposing more requirement parameters for custom classes (gender, custom variable, etc.) have been moved from the Input board straight to the Active column of the Roadmap board. We have also included cards for getting walkmesh/surface type via nwscript, NWScript PlayMovie() function for custom content, improving shader communication, improving shaders to be able to render on objects, not just textures and allowing tab-/mouseover-highlight/aura colour customisation through NWScript into the list of things we’re currently working on for Neverwinter Nights: Enhanced Edition. You can see what’s coming with the next patch on the Roadmap board. Among new features, the patch will make possible Multiplayer Tunneling (which we’re calling “NAT hole punching”), and players will be allowed to connect to servers behind NAT without having to deal with port forwarding. At the same time, servers will be allowed to list on the masterserver without having to port-forward or having to handle proxy/NAT port remapping issues. Congrats to Obsidian Entertainment on the release date announcement for Pillars of Eternity II: Deadfire. A UI Refactor of Neverwinter Nights: Enhanced Edition has many facets. We want to pursue this upgrade, but it will come later on the Roadmap as we still have a lot to investigate regarding this. We cannot show examples of normal/spec mapped textures in the game yet, but some great looking stuff IS coming, so get ready! 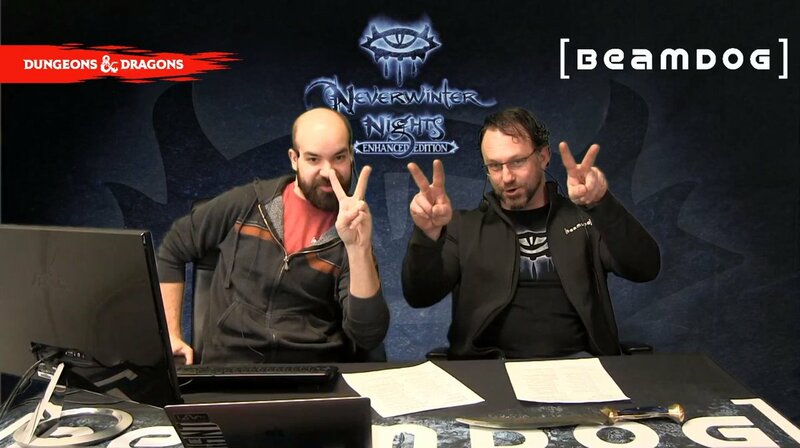 Character animations in Neverwinter Nights are something we’re looking into for the Enhanced Edition that may not happen for launch. Officially adding Baldur’s Gate: Enhanced Edition and Icewind Dale: Enhanced Edition portraits to NWN:EE would require us talking to Wizards of the Coast. We’ll see what we can do. Our goal with NWN:EE is to go forward and create new exciting stories. Trent has been replaying the original campaign lately and has been creating his “hate list”. That said, we don’t see us changing the existing content. If there are bugs in Neverwinter Nights: Enhanced Edition Head Start, submit them to Redmine and we’ll try to get to them. 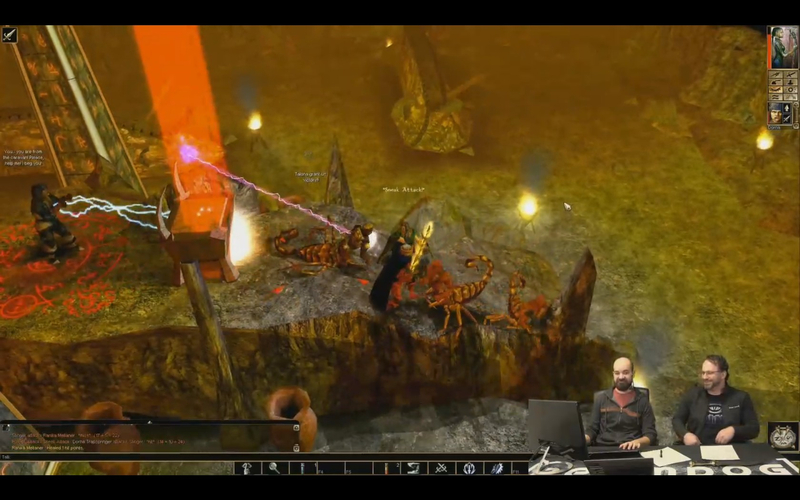 We play NWN:EE modules with custom content on stream and during personal time. What’s your favorite? Let us know! We’re not sure the Frame Rate Slider from Planescape: Torment: Enhanced Edition will come to Baldur’s Gate: Enhanced Edition with the 2.5 patch, but it’s an interesting suggestion. Phil would love to do an official Baldur’s Gate II: Enhanced Edition stronghold for the Shaman class. We’ve got a lot on our plate right now and can’t promise it as a feature at this time. We are currently looking for a few good designers, developers, programmers, and more! Head over to our career page here to check the latest job listings. If you’ve got the skills, apply and send a resume.